Written with Amy Rosenfeld, Ph.D.
Zika virus has been infecting humans since at least the 1950s (and probably earlier), but epidemics of infection have only been observed in the past ten years and congenital Zika syndrome in the last two. Two hypotheses emerged to explain this new pattern of disease: evolution of the virus, or random introduction into large, immunologically naive populations. Results from our laboratory show that one component of these disease patterns – neurotropism, the ability to infect cells of the nervous system – has always been a feature of Zika virus. Mutations that increase viremia in the human host, increasing the likelihood that virus will be captured by a mosquito taking a blood meal. Mutations that increase viral replication in the mosquito vector. Mutations that increase the ability of the virus to cross the placenta. Mutations that allow efficient replication in the fetus. Mutations that promote virus entry of the nervous system (neuroinvasion). Mutations that enhance replication in neural cells (neurotropism). This list is by no means exhaustive. The point is that no small animal model is likely to capture all of these steps. For example, no mouse model of Zika virus infection has so far lead to the development of microcephalic offspring. Therefore testing whether any of the the mutations observed in different Zika virus isolates are responsible for new disease patterns is likely impossible. 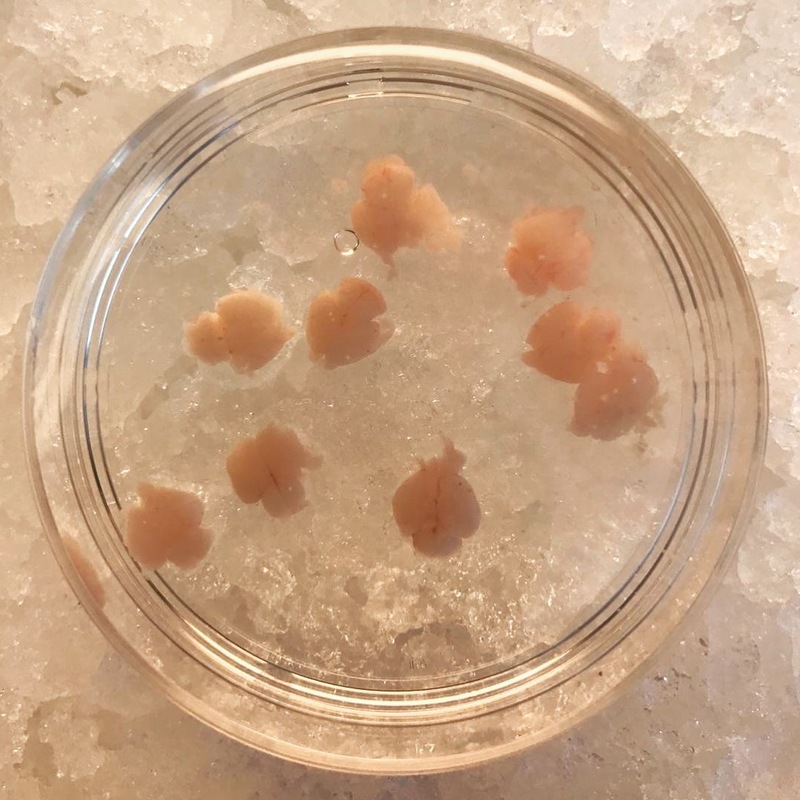 We have chosen to look at the question of how Zika virus disease has changed by looking at a very specific part of the replication cycle: growth of the virus in fetal brain, specifically in organtypic brain slice cultures. Here’s how it works: we remove the developing embryos from pregnant mice during the first, second or third trimesters of development (see photo). The fetal brain is removed, sliced (slices are about 300 nm thick), are placed into culture medium. The slices live up to 8 days, during which time brain development continues. The Vallee laboratory here at Columbia has used a similar system utilizing rats to study the genetic basis of microcephaly. Next, we infect the embryonic brain slices with different isolates of Zika virus from 1947 to 2016, from Africa, Asia, South America, and Puerto Rico. All of the isolates replicated in brain slice cultures from the first and second trimesters of development. These observations show that Zika virus has been neurotropic since at least 1947. Similar observations have been made with the 1947 isolate using human neurospheres, organoids, and fetal organotypic brain slice cultures. The incidence of microcephaly is greatly reduced when mothers are infected during the third trimester of development. Consistent with this observation, we found that organotypic brain slice cultures from the third trimester of mouse development support the replication of only two of seven Zika virus isolates examined – the original 1947 isolate from Uganda, and 2016 isolate from Honduras. Furthermore, these viruses replicate in different cells of the third trimester embryonic brain compared with second trimester brain. We are interesting in identifying the changes in the virus responsible for these differences. Our approach asks only whether different Zika virus isolates can infect brain cells when the virus is placed directly on these cells. We cannot make any conclusions about the ability of the virus to invade the brain from the blood (neuroinvasion), or any of the other steps in infection listed above. Our experimental system also reveals how Zika virus infection of the developing brain might lead to microcephaly, a topic that we’ll explore next week. This Virus is everywhere make sure to be safe always and get tested to prevent further complications, visit http://www.labfinder.com/apollo-medical-diagnostic/ to book a test and time near you. Get your results fast. What does it ‘matter’ to a virus, which cell it ends up in–assuming that the cell doesn’t destroy it? I would imagine that these are not really ‘seeking’ nerve cells, but they are cells that are best suited for viral reproduction or ‘storage’. Also: might there be a time constraint that restricts development of microcephaly to species with longer gestation periods?